How would you like to end the year with an extra $1,378 in savings? 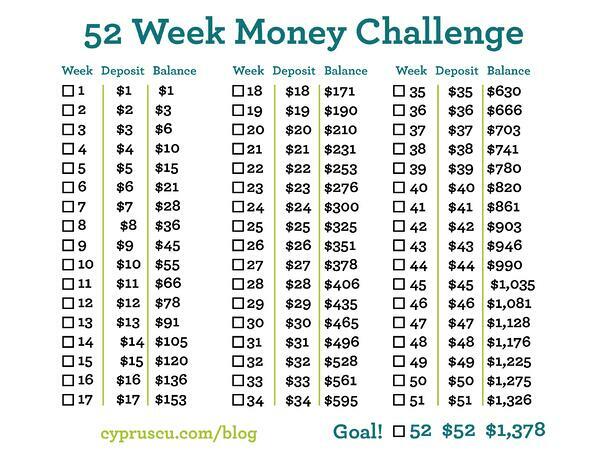 It may be simpler than you think with the 52 Week Money Challenge. Here's how it works. Start off by placing one dollar into a savings account starting this week. Then next week, add two dollars and so on. By starting with small amounts, you can get yourself into the habit of setting money aside. This is the account you first opened when you became a member at Cyprus. There is a $5 balance required to start this account. You’ll have easy and convenient access to your information through our Home and Mobile Banking systems, which is free to all members. There is a limit of six withdrawals or transfers in a calendar month. You can set up your direct deposit to go to this account. Shared Savings features a lower interest rate compared to our other types of savings accounts. Your interest rate will increase once you have a balance of $10,000 or more. This account offers a higher rate of return than a Shared Savings account. Unlike a Certificate, there is no minimum deposit and you can make up to six withdrawals or transfers in a calendar month with no penalty. These accounts do not feature a term length, but the higher your balance is, the higher the interest rate will be. This type of account is similar to a Certificate in that you can’t make any withdrawals until the end of your term. Unlike a Certificate, however, you only need a $20 deposit and you can continually add to it throughout the term (minimum $10 a month), but the interest rate will remain fixed. The longer term you set, the higher your interest rate will be. These accounts have a cap of $100,000 per member. All of our savings accounts are federally insured up to $250,000 by the NCUA, interest rates are compounded & paid each month, and there are no additional fees once your account is open. If you are interested in opening an account or would like to see current interest rates, check out our website or stop by a branch.